CHALLENGE US WITH THE PROBLEMS OF THE POORER COMMUNITIES; EVERY PROBLEM OPENS UP BUSINESS POTENTIALS FOR THE POORER COMMUNITIES. WE SHALL CONVERT THOSE INTO BUSINESS OPPORTUNITIES THAT GENERATE WEALTH, THROUGH REAL COMMUNITY DEVELOPMENT! Two Village Companies (Lakshmisagara Village and Kennalu Village, both in Padavapura Taluk) and One Taluk Company (Pandavapura Taluk) have been formed. 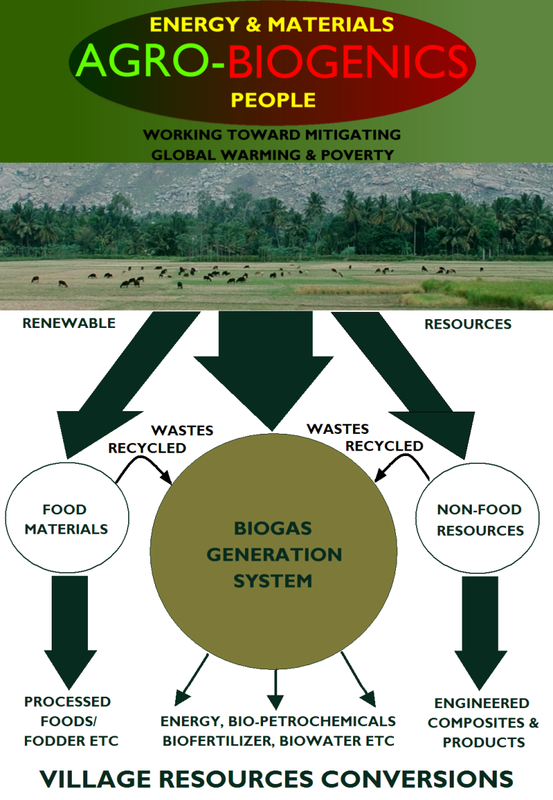 While the initial works at the two village companies would be the conversion of available agro-wastes into Wood substitute products, the Paqndavapura Taluk Co would convert the agro-wastes and animal wastes into Biogas. The Taluk company would also support the Village companies in Management/Marketing … All these works have begun in right positive note. 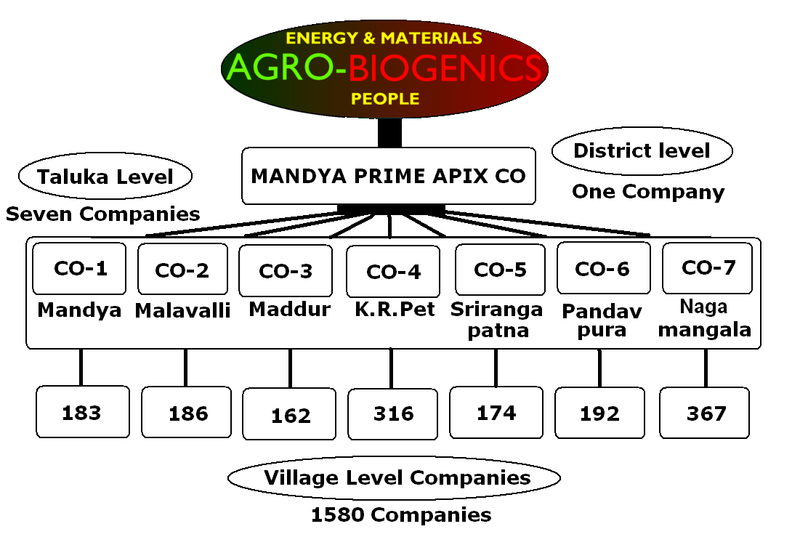 The following are the Companies names, under formation: (i) Lakshmisagara Village (Agro-Biogenics) Pvt Ltd; (ii) Kennalu Village (Agro-Biogenics) Pvt Ltd; (iii) Pandavapura Taluk (Agro-Biogenics) Pvt Ltd. While a steady Product system development is progressing at Kennalu Village Co, Lakshmisagara Village Company is organizing themselves. Pandavapura Taluk Co is also at the initial Organizing stage. It may be noted that each Taluka level Products-Business systems would be set up on the basis of a “Turn-key” arrangement through TECHNOLOGY & PRODUCT DEVELOPMENT CENTERS (TPDC) … These would be formed as Companies by Entrepreneurs within the Taluka involved. 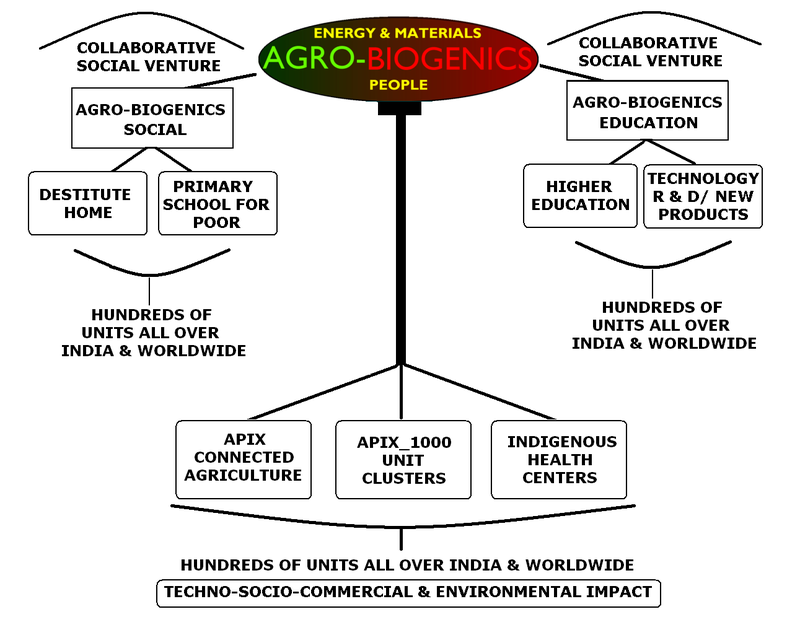 Such Taluka Companies would be supported by AGRO-BIOGENICS. … See Illustration below for the Net-woking of the different Companies. I am Jaya J K, working with an NGO in Mumbai, i am interested in your TVDP and I would like to do in Maharashtra , can you please help me out how to go ahead. my id is jaya.khemnani365@gmail.com and pls mention your contact details. Resp. Sir I know percapita can increase ONLY when there are sufficient works that are based on Value additions for Local resources. but as we know our 60-70% population are also working in Ag. field but maximum former are not satisfied from their production or income because he have no proper idea & planning , so I think if we motivate & better plan for Ag. they can increase their income & they will be satisfied from their work . We can proposed for them horticulture , dairy, goatry , vegetable production, etc but for this they have no proper idea, necessary resources or equipment & money. If we support them for proper idea, necessary resources or equipment & money they will be survive & increase their per capita income. This type activities will support to that family & environment also . 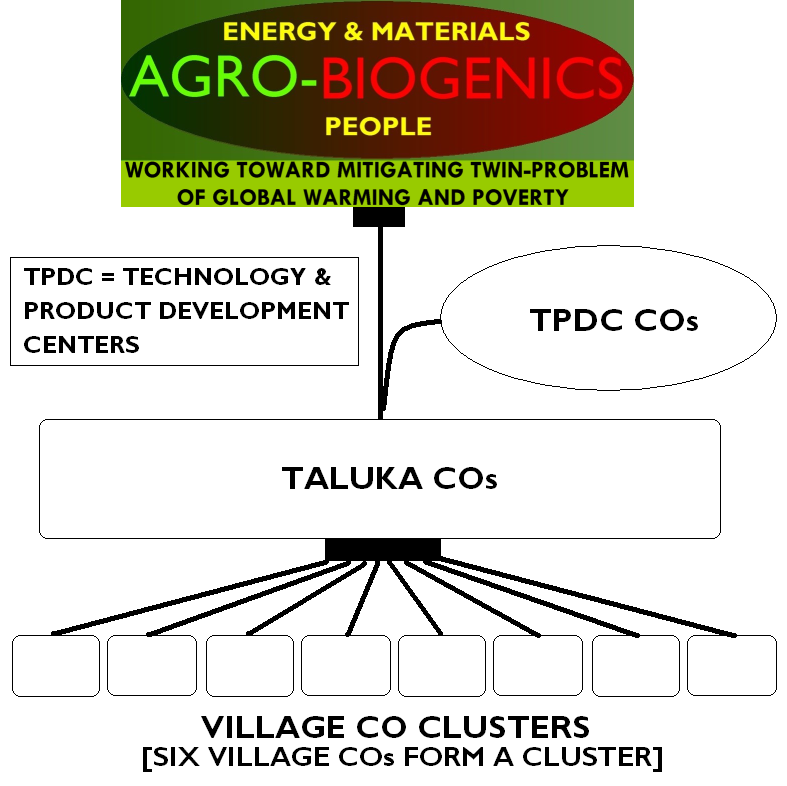 it is very Good and usefull idea i am very impressive i am in working in Bagalkot Dist Hungund Taluk, how we can i start this busienss in my working Villages can u help me we try to module Village of the Bagalkot Dist. I,m Manoj Kumar Pandey from Allahabad U.P. . I,m P.G. in Social Work(MSW) and working in Rural Development sector from last 11 year. I have been worked on INHP -II Phase of CARE, Water, Sanitation & Hygiene Project of WaterAid , Present time I,m working as Project Officer/Team Leader on Deptt. of Rural Dev. Govt. of M.P. in Integrated Watershed Management from Sept. 2006. so I know very well about TVDP. I can say without any hesitation that we can,t plan Total Village Dev. Programme. as a ideal or model plan I think without visit of that village we can,t asses their problem. I think for this plan first we select our village and through SWOT analysis /PRA / LFA / Net Planning we go to best plan for that village. Our roll model plan is a basic problem for Rural Development . with regard I real appreciate and I know its possible by best planning & proper implementation, I, have also some plan and idea,s for poor, productivity enhancement in Ag. livelihood, micro enterprises, etc. which can execute n give better result for growth of PER CAPITA INCOME . I AM FROM SINDH PAKISTAN,DISTRICT THATTA,I AM HAPPY YOU START A BIG ISSUE OF THE WORLD “POVERTY’ I AM ALSO LIVING IN POVERTY SO I BETTER KNOWS THE PROBLEMS OF THE PEOPLE’S OF COMMUNITIES.ACTUALLY IT IS THE BASIC RESPONSIBILITY OF THE STATE,BUT UNFORTUANTLY THE PEOPLE OF THE STATES ARE IGNORED THE ISSUESES OF THE POOR PEOPLE’S AND THEY DEVELOPED HIS OWN BACKGROUND AND THEY ESTABLISHED DAY BY DAY AND COME IN TO RACE OF THE RICHEST PEOPLE OF THE WORLD.IF I WRITE THE ISSUES OF COMMUNITIES,HERE MUCH AND MORE LOCAL NGO AND INTERNATIONAL NGO’S WORKING TO CHANGE THE LIFE OF THE PEOPLE’S,STATE ALREADY FAIL AND THESE ORGANIZATION COME NOW WITH MILLION ,BILLIONS DOLOR TO CHANGE AND DECREASE THE POVERTY.BUT SIR HOW I WRITE FOR THOSE NGO’S,HOW THEY ARE WORKING.IF YOU CONTACT WITH ME I WILL TOLD YOU HOE OUR PEOPLE’S ARE LIVING AND FEEDING.THERE IS NO EDUCATION,NO CLEAN WATER FOR DRINK,NO HOUSE IF IN A VILLAGE SCHOOL AVAILABLE BUT TEACHER IS NOTHING AND STUDENT COME WITHOUT DRESS, SHOES,WITH OUT CLEANING,I VISIT DIFFERENT AREAS OF MY DISTRICT WHEN I SEEN THESE CONDITIONS MY EYES CARRYING.WHERE ARE USING THAT MONEY THOSE NGO’S.SORRY SIR THIS TIME WHEN I AM WRITING THESE WORDS LIGHT WILL GONE AFTER 10 MINTS FOR 3 HOURS AND MAY BE I WILL SLEEP.SO SORRY NEXT STEP I WILL WRITES.GOD BLESS YOU…. .
Sir, Please send details . I want to implement it in Tamil nadu. Thanking you. We have already interacted on the issue. 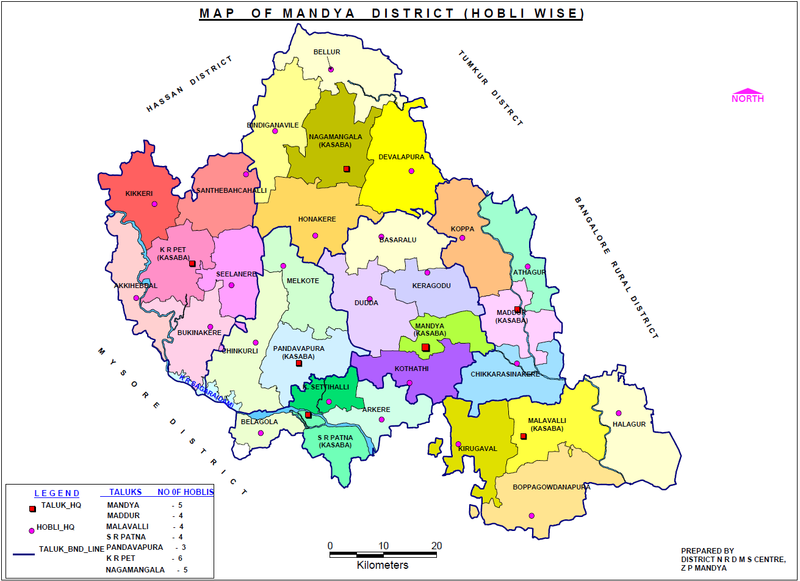 I have to say you that, I have a network of farmers of 125 villages in Bolangir district of odisha. How can we start this programme there ?Explain me in details . I stay in Kerala. I’d like to know how I can participate and implement your ideas. I Am an HR consultant. 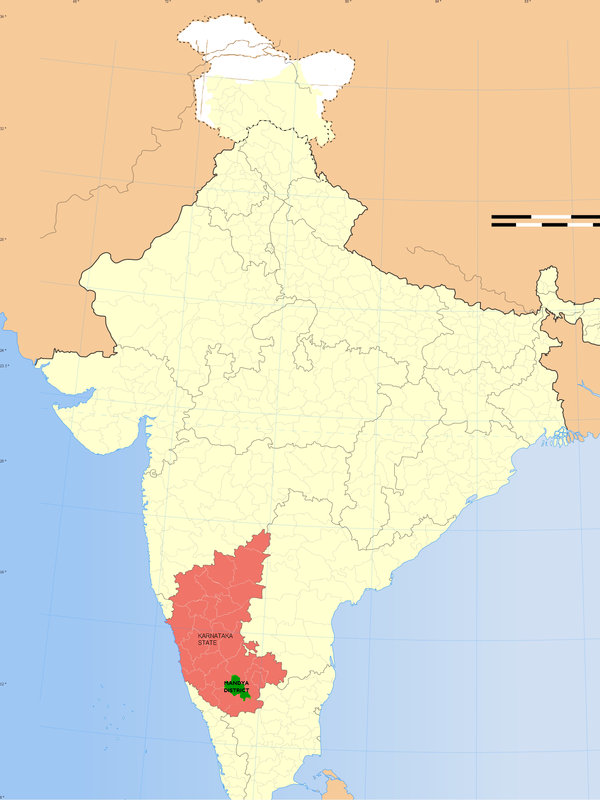 Could you explain me how we can utilize this project in Tamil Nadu? YES, WHAT TYPE OF WORKING IMPLEMENT MODEL FOR DEVELOPMENT VILLAGE MODEL. We, Suri Natun Juger Pratyasha, a registered NGO ( S/IL 27996 of 2004-2005), registered under West Bengal societies Registration Act, 1961, have devotedly been associated with different socio-economic development program for the welfare of the marginalized communities in the remotest part of west Bengal and adjacent Jharkhand State bordering the State West Bengal through livelihood promotional activities, education for marginalized community children, Health awareness Program. 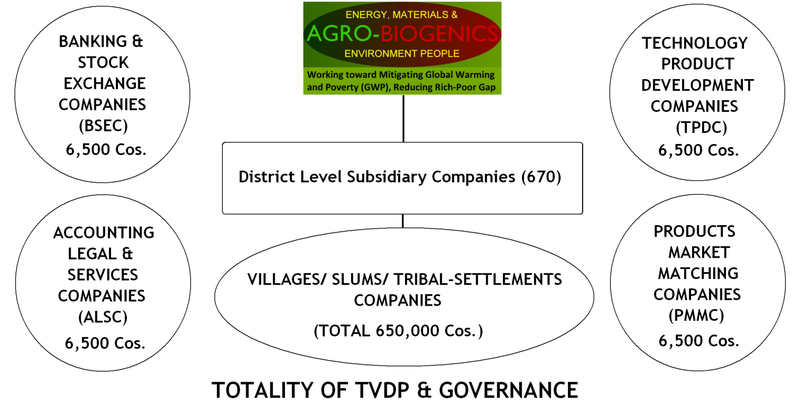 We will be associated with TVDP for the welfare of the rural communities. My trust is from Odisha. could you explain more on it.